I am sitting on the wheel barrow, waiting for the sunset to welcome the cover of darkness, for the journey I am about to make must be masked in darkness, to hide my tears and restrain the anger that consumes my veins, threatening to burst free from my burning eyes. I watch the last rays of light flicker brightly across the Nyeri skies, momentarily pausing to illuminate, deliberately I have always assumed, the beautiful Aberdares Range that surrounds my village. At that moment, looking at the burning mountains standing proud and majestic, am suddenly swept by a chilling surge. It is as if the Aberdares are talking to me, voices filtering through my eyes. “Don’t worry” they seem to say. If I had my way, I would hold the sun hostage and force it to shine brightly above my village. There would be no darkness, no sunset. But it can never be. As if reading my thoughts, the bright rays turn on me, looking me straight in the eye, blinding me – as if to warn me to abandon my evil train of thought. And then, suddenly and without regard for me, the sun retreats and disappears behind Nyeri hill, leaving me clinging on hope – hope always near, yet so far. Darkness sets in, it is time. I grudgingly rise, make my way inside the house and light the lantern. The layers of soot covering the glass dim the light emitted by the burning wick, just the way I like it, dim enough to hide my face, bright enough to seek his face. She turns her face away from me, pretending she does not hear. She has pretended not to hear me for two years now. I don’t buy her pretence. Even though I have never seen her cry, I see her swollen eyes and the protruding veins that run across her forehead and hear her heavy breathing. Even though she tries very hard, I have never missed her suppressed mumbled cry, as I leave the house for my every day journey. “Where do I start today?” I think out loud. As if to answer me, the wheelbarrow lets out a squeak so familiar as I push it towards the gate. My journey is always dictated by fate, I ask for a sign to lead me to where I am supposed to go. I stand at the gate, holding the handles of my worn wheel barrow, waiting. Yesterday, the sign came in the form of a sudden strong wind that blew towards the Majengo slums. I followed it and sure enough I hit the bull’s eye. Suddenly, a motor bike races past me. I can’t make out the figures bundled together, clinging dangerously to the bike but one thing is for sure, that is my sign. It is simple. A speeding, overloaded motor cycle on a slippery village earth road, means only one thing. That those individuals on it must be coming from where they all go, lost places that are always found, dens that are not a secret – the place I must go, Majengo it is. “Am lucky today”, I convince myself, as I hastily meander through the dark paths, familiar shortcuts tattooed at the back of my head by the sharp needles of experience. Thirty minutes later, I am in Majengo. I can see Namu’s homestead. Namu, my first crush in Form One, tall, light- skinned, with a smile accompanied by beautiful dimples. Namu who made me spend my savings, fifty shillings to be precise, to accompany him to the Havana dance club in Nyeri town. Namu who showed up to the dance with some other girl, who clung to his arm and constantly rubbed her behind against his life storage facility. Namu who left for Eldoret without even saying goodbye. Namu who broke my heart. I pray that I don’t meet him. Of course I want to meet him. But not today, not in my rags, not in sweaty form and with dusty cracked feet. Maybe when am all washed up, dressed in my pink dress, the one that flows with the wind and rests well on my buttocks, maybe then. I practically race past his house, a door opens, I curse. “I won’t look back, I won’t look back,” I don’t look back. I arrive at the slum well into the night. Most of the shops are closed, the lit paths are deserted and it’s relatively quiet save for the numerous barking dogs and for sounds coming from a dingy shack behind the butchery. I take a deep breath and start towards the shack. The place keeps on changing, the walls are always painted differently. Signature streams of urine marked patterns from patrons who stagger while urinating, unintentionally creating masterpieces on the wall. But there is always a winner. At the far end of the wooden structure, a splash of thick substance decorates the wall, perfected in a bout of diarrhoea. The first time I accompanied my mother to this dingy joint I vomited and cried hysterically. It could not be….I refused to believe that such a place could be anyone’s home…. I don’t have to look for him, I know where to find him, at his favorite spot under the table at the far end of the den, dead drunk, wet with urine and wearing a bloodstained shirt; his blood or someone else’s, we shall know tomorrow. I walk towards him, escorted by numerous pairs of droopy eyes and tingly hands wanting to touch me. These drunks cannot touch me. Wanjohi, Jeremano’s father, once spanked my behind. He wished he hadn’t, for I turned on him with hell’s fury, kicking and screaming, the broken bottle run well across his face, twice. “Father, it’s time to go home,” I tell him as I kneel beside him, nudging him to wake up. It will take a while. It has not always been like this, like today when my father is lost, a shadow of himself, a drunkard….there was a time when he was different. Back then, when we would wait for him at the “2nk” bus terminal the whole day, to come back from Nairobi. He always brought us Nairobi bread, a huge loaf that we would eat for days, and we would sit on his lap and he would listen to our dreams and urge us on. He taught us how to eat raw coffee berries and sweet potatoes and Mother would always threaten to beat us, but she dared not, for we would hide behind our father. At school, our stories began with my Daddy did this or my Daddy that, he was our hero, the coffee farmer, the businessman, the matatu driver…. I drag him out of the den and help him onto the wheel barrow. He lifts his head to speak. “Get me my bottle”, he barks. I die. As I am about to leave, a firm hand grabs me from behind. I turn to face my assailant. It’s him, Kariuki, the owner of the den. Back then I would argue with him, curse him, blaming him for my father’s deteriorating condition. Not today. I know what he wants. “Father, I am coming,” I shout, as Kariuki’s firm hand leads me to his filthy kitchen. There is no ceremony, there are no sparks, he pushes me to the floor, tears away my underwear and plunges inside me. As he sweats on top of me, I know that I am paying for my father’s drinking debts, saving our quarter-acre farm. Five minutes later, I limp out of the den to find my father snoring on the wheelbarrow. He has pissed himself again, my body is sore, it’s midnight. I grab the wheelbarrow handles. It’s time to go home. Ann Waruguru Kiai was born in Nyeri County, Kenya, and raised by a legend – her mother. 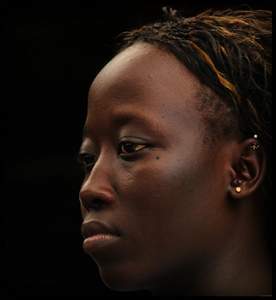 But, growing up, she almost believed that black girls were not beautiful, until she saw Wangari Mathai. Ann has a law degree. 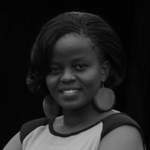 She writes short stories and poetry and is inspired by the women from her Nyeri village, who she sees as defining beauty, strength and resilience. Ann writes to tell their stories, to sing for them, to celebrate them. She gets to tell the world “You are out of order” in her own way, in our way.